It is so easy to throw your hands in the air and give up before you even begin decluttering due to the thought that you can’t possibly get the job done to your perfectionist standards. You might be interested to know that quite often hoarders are perfectionists that gave up trying. If you get an image in your head about how you want things to be and then see the disparity of where you are now and your ultimate goal, the journey in between may appear insurmountable. Therefore you give up before you even begin. Just yesterday I was lamenting the boxes of my daughters clutter that are still in my house that I really would like to see the back of. She isn’t settled in a way that really allows her to take her clutter away but it still drives me crazy storing it. After pulling down a few boxes and then changing my mind about reorganising it I really felt rather disinterested in tackling any other tasks that were awaiting me. That feeling of defeat can soon permeate your whole being if you allow it. Instead of letting it affect my day I resisted the temptation to throw my hands in the air and give up. Instead decided to put on a load of washing and then declutter my sock drawer instead. In complete defiance of the give up attitude I followed up with doing the ironing, two more loads of washing, cleaned out the fridge and freezer and wrote this post. I admit it, I am a perfectionist and I like to do a great job of whatever I decide to tackle but I also know when I have to settle for good enough. I know that I felt better about my day yesterday than I would have if I had sulked around for the entire day achieving nothing. I guess you could say that, for me, doing nothing is a far worse option than having to settle for less than perfect. So ignore your perfectionist side and just do something, anything that is progress. If that idea is abhorrant to you, focus your perfectionism on one small attainable section of the overall task then move to another while wasting no time thinking about how far you have to go. 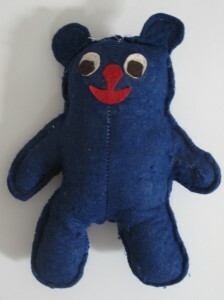 One thing Bridget did allow me to declutter from her vast collection of things left behind was Blue Bear. It’s not much but every little thing counts. Knowing that I can ignore the perfectionist side of me in preference for just making progress. A job worth doing is worth doing well but most of all it is just worth doing. Blue Bear would have been the last to leave as far as I am concerned – well, as long as s/he isn’t a bug repository! Apart from that, the main post seemed really familiar to me. Do something, even if it’s escorting the contents of the bins to the rubbish chute or the recycling to the receptacles at the bottom of the block. Blue Bear is a little bit cute but she has so many other keepsakes the line has to drawn somewhere. As you say, do something anything just to get some momentum happening. Sitting around feeling sorry for oneself isn’t going to do that. Self-confessed perfectionist here 🙂 Although i am the opposite, my quest for perfection is my motivating force and it never really hinders me, i’m always striving for it. This was the main reason my home got cluttered up, i was always seeking the perfect items, be it clothes, household items etc. I was a big consumer, but often felt dissappointed with my purchase so i would set about finding the next perfect item, and so the cycle continued. Now by paring back my home and possesions i strive to be the perfect minmalist. Same personality trait, applied differently, but the latter makes my life easier and much more simple, not to mention easier to maintain. Interesting post, as yesterday you said that you hope to make less spelling mistakes, and a few people said they didn’t mind your mistakes and that it was part of your style, me included. What you find to be less than perfect, other people like and really don’t mind a bit. I think we are our own worst critics. you and I sound scarily alike in many ways. It is funny how a trait can serve us well in one way but drive us crazy in another. I think I actually prefer to be a bit of a perfectionist than not, because it really does keep me striving. Fortunately I have learned to accept my foibles as well which is probably why my proof reading still leaves a lot to be desired. Ah yes, other people’s clutter. I love my son, I love his passion for trains and craft (he’s 9) but it drives me nuts!!! I’ve had to come to terms with his room being his sanctuary and just closing the door. Sometimes I wonder if they switched babies on me, he is my polar opposite when it comes to possessions and “stuff”. But then, when the planets are correctly aligned, I will find him tipping out a drawer, sorting through it and recycling or donating half of its contents. There is hope for the lad yet. my son is just like me, poor fellow, except that any stuff he does love he like to haves out where he can see it. Needless to say, like you, I just shut the door and let it be his sanctuary. I vacuum the floor and dust any open spaces regularly but his work space I just ignore for a long as I can. Like you son too, he gets in and declutters little areas when he decides it is getting our of hand. That’s good enough for me. welcome to 365 Less Things and thank you for dropping in to leave a comment. It is always good to hear voices, old and new. Here is something I want you to focus your perfectionism on to ~ I want you to achieve a perfect record of finding ten minutes a day to find just one thing to declutter. Pick the easy things to begin with, just things that you will donate, not anything the needs advertising and selling. Open a draw or a cupboard and pull one thing out, that’s all it takes. Put the items in your transition area and keep at it every day until you have a load worth taking to the thrift store. I am sure you can manage this small task. Pretend there is no goal except to find that thing each day. You can do it I know you can! I look forward to hearing how you conquer the challenge I have set for you. I have every confidence that you will rise to the occasion. I am glad you are finding my blog useful. Lets hope this is the turn around point for your clutter. Love today’s post – I always called myself a “thwarted perfectionist”! if I can ignore my perfectionist side anyone can. Hi Colleen! You know you talked just like my dad does on the perfectionist side, but the difference is that you did something, my dad is waiting the “perfect moment”. Yes, he is always awaiting the time when he will have the time to clear out evething. I was visiting and grabbed a huge box of old textbooks that nobody uses anymore (it was just one box and he has loads of them) and said he should donate it to a library. He looked at me like I was suggesting he should be killed by me and his body hidden 😀 ! My step mother is an extreme minimalist, but respects his stuff, but she did agree with me. But no, he wouldn’t do it. He will only get rid of the boxes when he can open them ALL at once and decide. We all know that is never going to happen. So just to give my message I talked to my stepmother (within his hearing, but i wasn’t talking to him) about how I read on the internet about this poor children that had to spend weeks in their parents house after they died to throw all that trash away, because they hoarded useless stuff, just like my Dad. Dad didn’t like the talk, but he wants to do perfect and does nothing! it can be so frustrating can’t it. You did the best you could to covertly convince him if not for his own sake to take care of it. But alas his stubborn streak is strong. Or is it his selfish streak, it is often hard to tell when the person knows that their useless clutter is a burden to others. I’m one of those “poor kids” that had to empty a house after a death. I’m not sure why anyone would save tax returns dating back to 1946 but I can tell you it was no fun shredding all of them. Also came across the Mother of the Bride dress my Mom wore to my sister’s wedding 30 years ago. Bright emerald green. When I saw it I realized I have the dress I wore to my own daughter’s wedding hanging on a door, just the way it came back from the cleaner’s 2 years ago. That’s gotta go. I don’t want my children cursing me out after I’ve gone. Clothes go out of style and how many times will you have an occasion to wear something like this? I don’t think most of us have our homes in “dying order” but we all gotta try! Believe me, cleaning out a house is no fun! Please, people don’t save every Christmas and Birthday card you ever received…..
if you have to save really old photos, how about putting the name of the people in the picture on the back, with a date…..I have tons of photos and I have no idea who they are. Look around, did you save every vase a flower arrangement came with? Your kids won’t thank you. You don’t need all those bits and pieces of ribbons either. Frugality is one thing, hanging onto everything that comes into the house is another. If people knew how much it cost to have some of this stuff carted away, they wouldn’t save it. There’s only so much that is “donatable”. Besides, when you are overwhelmed with grief and more important matters, you don’t have the time or energy to find “homes” for everything. Hi Amy! thanks for your thoughts! I wish my Dad would read the blog, but when I mentioned it he almost ran screaming 😀 ! He holds on to stuff because he thinks he will use it all someday. He is projecting a future that he knows won’t happen. We, as his kids, have tried to take our whole lot of stuff away, so he can not use us as excuse to “store” things. But what lot he has kept, he hangs to very tightly. I don’t understand. I have my flaws, I do love my books, I read them, and I keep the ones I have in nice shelves in my office. They get dusted, they are on display, because I consider them worth it. The ones that were not, were slowly decluttered with Colleen’s help. So they are not a guilty secret. My Dad keeps books and papers and whatever else in cardboard boxes, inside storage places. It is just a lot of boxes that will have to be open and sorted through. I mean, if he had a shelf and a nice filing system, when the worst came, it would be easier to deal with it. It is difficult. He gave me an urge to declutter even more and to better my filing system. look on the bright side when the inevitable happens you can just take the boxes and donated them to the library or thrift store. Don’t even look in them because you don’t need to add to your clutter either. What you don’t know is in there you won’t know you are missing out on. Amy, for some reason, the way you said this (and the rest of your comment) somehow made a difference in my thinking. I was holding onto “cards and vases and bits of ribbon” – and thinking it was all right, because I wasn’t keeping “actual trash”. I’m so glad you decided to comment – for me, it was an “aha” moment about some articles I was having trouble getting rid of … so, thank you. Funny how you can hear basically the same thing many times and then you hear it put a little bit differently and suddenly you get it. sometimes someone really has to slap us in the face with reality in order for us to get the picture and Amy’s comment must have done that for you. I often think about what will happen when my folks pass away. Will I even care to keep anything they leave behind, even the historical stuff. I don’t it especially if the photos they have do not identify the people that are in them. What good are they then. Good for you Jo. Well done! and a good two cents worth it was too. I have never been in this position but I won’t be putting anyone else in this position either. Hopefully all my talk of decluttering and clearing homes during times of grief will sink into my parents and in-laws and they will have everything in order before the inevitable happens. I’ve linked it in my earlier post.. I think Amy’s comment was what you needed to hear not what I had to say. It really does pay to read the comments doesn’t it. So glad you appreciated my comment. I was almost afraid to say anything since it wasn’t exactly about today’s topic of perfectionism. When I read Andreia’s frustration about her Dad’s things, I decided to post and I’m so glad I did. I thought it was pretty good…I read some of the comments and people had suggestions for what to do with these items, like donating old towels to your local humane society, donating hangers to your local cleaners, and ripping the fronts of old greeting cards to send to St Jude’s, etc. They are all good tips but if these things are going to get done, they have to get done now. I had a huge stack of old greeting cards to get rid of when my relative died……and I can tell you I had no time to rip them apart to send them to St Jude’s. When push comes to shove and you only have a limited time available to empty a house, well, these things just don’t get done. My relative would’ve been turning over in his grave if he knew how much I had to spend on a dumpster service to cart all the clutter away. That is the saddest part. Clutter really does cost us real money and people don’t realize that. when I’m gone and I’m trying hard to make it easier on them. It will be one of the best “gifts” I can give them. thank you for the link, I have added it to Friday’s Favourite Five for this week in case people miss your comment. I have added your comment too because it is a good conversation. I have had many readers who have gone through this same sad process of sorting through the clutter left behind when a loved one passes. You describe the situation well and the fact that it ends up costing you money is very unfortunate. Sadly when you mention this subject to some elderly folk they say “Well the family are going to get my money so it won’t hurt them to do a little work to earn it.” Sad but true I am afraid. The thing is people don’t have to be old to die, it can happen any time. So now is the time to get our affairs in order not when it’s too late. Things can happen suddenly and people can also get too old and infirm to deal with the situation if left too long. So Amy I am glad you are doing the right thing by your loved ones. After reading this comments stream I think I will get in and sort Bridget’s stuff into boxes with her name on it just in case. Even the stuff you aren’t getting rid of should be sorted, collections all together, things with parts stored together, other peoples stuff identified etc just in case. You are so right Colleen, I have heard many elderly folks say this very thing. Unfortunately, it’s not a “little work”, it’s a ton of work when you’re exhausted from caring for your elderly family member, and then needing some space to grieve. You are literally thrown right into a gazillion decisions, legal matters and more. You have to put your grief aside to do all the things necessary when cleaning a house and getting it ready for sale. I don’t regret for a minute the time I spent caring for them, but the hours wasted going through things that could’ve been tossed years ago, is time I will never get back. 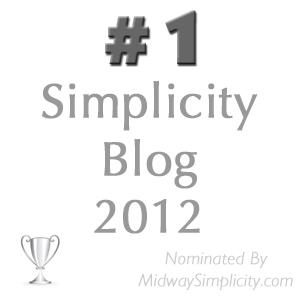 We can also lessen this a bit by de cluttering now and your blog really helps and encourages people to do this. By the way, I am delighted you are including my comments in your Friday “favorites”! I am more than late this week – but reading andreias comments urged me to say something, too. I think she is somewhere in south america so there’s half a world between us and still my parents seem to make the same excuse as her dad. That they can’t declutter certain things or areas because it is not theirs or because that which is not theirs is in their way … I know there are still some things that belong to me in their house, some of it I’d actually would like to have, most of it I’d be likely to declutter. They can’t give it to me as they have shoved it in some far away corners and put their own stuff in front of it. My sole consolation about this madness: as long as my stuff is taking up space in their house they won’t fill this space with even more things (things they don’t need because they can’t reach them anyway in the corners of the attic or the second row on the top shelf.) I am sad though because taking my stuff as hostage, sort of, and then use it as an excuse (one of the countless excuses) for all the trouble they are going to leave behind is not really contributing to a healthy relationship. And that they spent so much time “organizing” their stuff that they feel too busy for spontaneous cups of tea or other activities does the rest. I learn from their example – do to it differently. But that’s the hard way . the end to your story reminds me of Berenstain Bear book I used to read my kids when they were little. The father bear was hopeless at doing anything right and would often say “This is what you should not do, so let that be a lesson to you”. I often think of that quote when I hear stories like this. I suppose the thought of dumping the mess on someone else just isn’t as repugnant to them as taking care of it themselves or that there is so much useful stuff amount their treasures that someone will be glad to sort through it. Perhaps they just need to to told the truth, that no one wants to have to deal with it when they go. Awesome article Colleen. I know I’ve battled with perfectionism for quite a while. It was only when I realized I’m just complicating life for myself that I stopped caring about every single little detail, and actually started acting on my decisions. I contemplated too much, going through each scenario in my head, and choosing the one I thought perfect. This thought process was present in every single one of my daily activities. Even the most minute of details had to be perfect, and it always bugged me that it almost never worked out the way I pictured it. I know my description of perfectionism might seem a bit grim, but thinking back on my life, it was hell to go through all that. welcome to 365 Less Things and thank you for dropping by and weighing in on this subject. We certainly agree on the futility of perfectionism. It isn’t only hard work but can also be debilitating. I am glad that you realised the error of your ways and so have I. I will take some time to read the link you sent me in case there are a few extra pointers there that will help drive the message home. This is a small thing but as a “saver of things I might use in another way”, I am working hard to overcome this trait. Last week, I made a potato dish and my potato peeler just didn’t want to work. The blade was getting dull so I purchased a new one. As soon as I opened the new package, I threw away the old one. As I said, a small step but heading in the right direction. I will say though, that the new peeler is not as sharp as the old used one and the handle is not as long so it is hard for my arthritic hand to hold. But the old one is gone so must adapt. The new one is by the same company as the old one, just their 2012 model. Not as good.